We’d like to thank Doreen for sharing this story. 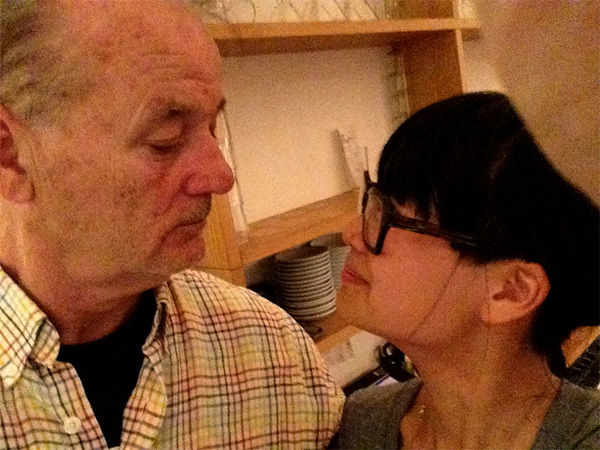 I was working on a windy, hot Saturday evening at a Thai restaurant in Kreuzberg, Berlin when I met Bill. In the beginning, I didn’t really recognize him; I just thought he was one of those confident, older American men who are not afraid to ask a lot of questions and make a lot of banter. He was telling me he had visited a haunted house earlier that day – but it was really busy at the restaurant; I had much to do, so I was rather dry and short with him at first. But, after he had spoken to me for something like 30 seconds, his voice gave me the sensation that I was in the film “Lost in Translation” – it was really Bill. He was accompanied by a young, blonde American woman and two nervous, giggly Germans with press passes swinging around their necks, who laughed a bit too loudly at his anecdotes every time. He didn’t really know what to order, so I ordered for his table a fine bottle of French red wine, prawns, and duck, which they all shared. At the end of the meal, he came to the till, paid for everything himself, and asked for a card from the restaurant. He complimented me on the food and the service. I shook his hand and introduced myself. We took three photos together, the last with him boring his eyes into my skull. It was really like I was in “Lost in Translation” and I was curious to know if he was acting in the picture, even though he was off-duty that evening.